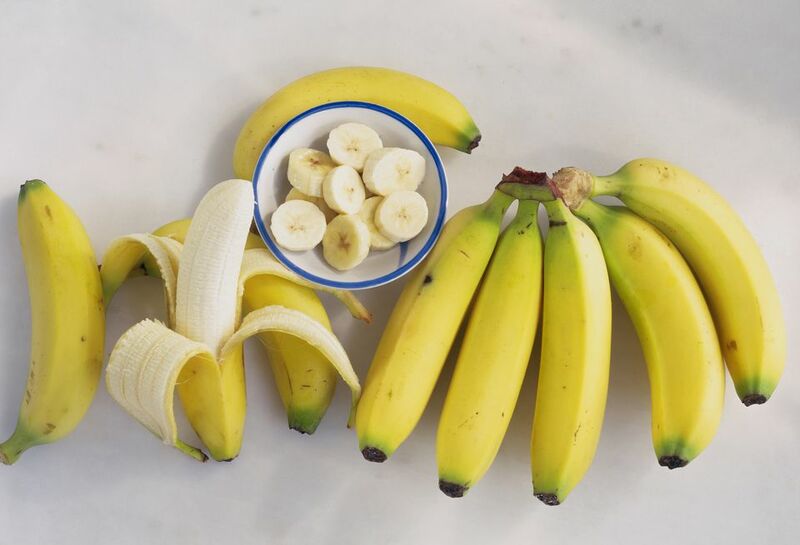 Rather than watching bananas over-ripen in the kitchen and having to toss them out when they become mushy, freeze them at the point of ripeness for future use in ice cream, smoothies, muffins, pancakes, and desserts. The preparation is simple and the entire process takes little time. Frozen bananas can be used in many baked recipes. They give smoothies a rich, milkshake-like texture, and bring a hefty dose of potassium and other nutrients to the party. It is true that banana pieces can clump together in the freezer and whole frozen bananas are hard for most blenders to handle, but when you use a single layer freeze method, the banana pieces don't stick together. They remain loose so you can take out just the amount you need. The pieces are the right size to blend to a smooth, creamy consistency. Choose fully ripe bananas. The peels should be yellow without any green showing—freezing does not improve the taste of under-ripe fruit. A few brown spots on the peels are fine, even desirable. Slice them crosswise into rounds between 1/2 and 3/4 of an inch thick. This single layer freeze ensures that the slices of banana remain separate and easy to handle. Spread the banana pieces in a single layer on a baking sheet or on plates. Space the banana pieces so they do not touch. Freeze the fruit, uncovered, for 1 hour. After an hour, the bananas won't yet be totally frozen but they will be starting to stick to the sheet or plate. Dislodge each piece by moving it slightly to the side. This step is optional, but it makes it easier to move the fruit pieces later. Freeze the banana pieces for 1 more hour for a total freezing time of 2 hours. Transfer the frozen bananas to freezer bags, plastic containers or non-plastic freezer containers. Label and date the bags or containers. You can store bananas in the freezer for up to 8 months. They are still safe to eat after that, but their quality starts to decline. Blend straight-out-of-the-freezer bananas with milk or non-dairy alternative and a little yogurt or silken tofu. The frozen bananas give the smoothie a great milkshake-like texture. You won't need to add the ice cubes some recipes call for. You can also use frozen bananas to make ice cream, banana cream pie, and other desserts. Thawed and chopped, you can use formerly frozen bananas to make banana bread, muffins, and other baked goods. Frozen bananas are just as good as fresh bananas in pancakes. What Is a Good Method to Oven Dry Strawberries?